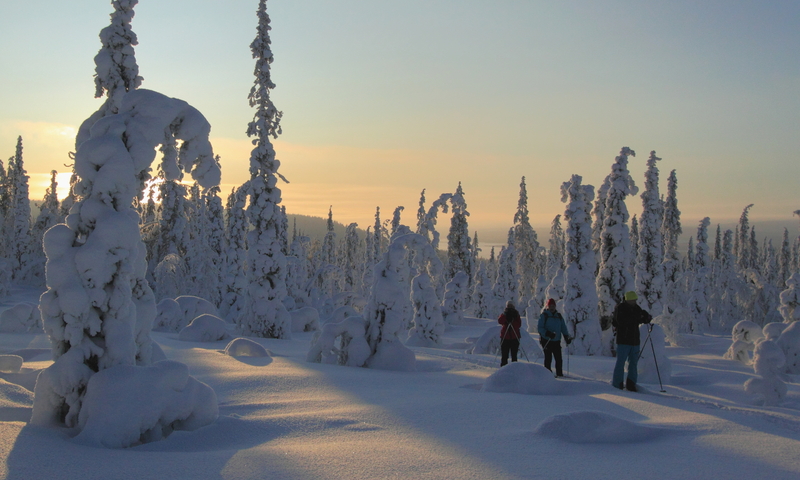 This back-country ski tour on Pallas-Yllästunturi National Park takes you to the serene snow wilderness of Finnish West Lapland. A professional guide leads us in silent woods and on majestic treeless hills – Tunturi in Finnish. In the middle of our day, we have a lunch break in small huts or tepees where campfire gives light and warmth to our rest and relaxation. During this ski tour, we ski with touring skis partly on prepared ski tracks as well on snowmobile tracks and wind-hardened snow blanket on open hill areas. Rent of skiing equipment is included in the package. The luggage will be transported from cabin to cabin, so on the ski track, you need only a small backpack for lunch, warm drink, and accessories for that day. Duration of a skiing day is 5 – 6 hours. After a brisk skiing day, we relax in a bath in a sauna and have a delicious dinner. We stay the night in simple but cosy huts, where the only comforts are a wood-heated sauna, a tasty meal, good company and warm sleeping bag. Day 1 – Arrival day. Transfer (optional) from Kittilä airport to Rauhala Village. A short introduction to the next days’ program. Dinner and overnight stay in cabins or rooms for 2-3 persons. Day 2 – After breakfast, we make our luggage ready for transportation to the next overnight place. The guide tells about the program and route of the tour. Before the start, we test ski equipment and the tour begins. Ski route takes us first to Lake Keimiöjärvi and then after to a little Village of Rasti. In Rasti we have our evening meal, sauna and overnight stay. Day 3 – We start our touring to from Rasti Village to Fell Sammaltunturi and old Reindeer herders’ hut. After our break, we will continue on the side of open hills (tunturi) to Pyhäjoki River and further to Pallasjärvi Lake where we have dinner, sauna and overnight stay. Day 4 – From Pallasjärvi we head our skis to Pallastunturi Fell and from there to our overnight place in Harrisaajo, where we will have dinner and sauna. Day 5 – We make a day tour from Harrisaajo to the surrounding Fell areas and Rihmakuru valley. Lunch break in a tepee on the open fire. Day 6 – Another day with a breathtaking view from the fell tops. From the Pallas Fells, we go down to the information centre of Pallas-Yllästunturi National Park. We learn about the nature and history of the area in the centre through exhibition and multimedia show. Bus transfer to our starting point at Jerisjärvi Lake where we have dinner and overnight stay. Day 7 – Our last skiing day takes us on a day trip from Rauhala through snow-covered tranquil woods and hilly grounds. Day 8 – Departure day, breakfast at Rauhala. Due to the weather conditions and other circumstances, minor changes to the program are possible. Accommodation for the first night and two last nights in the base camp Rauhala in holiday cabins or rooms for 2-3 persons. During the tour, accommodation is in wilderness huts and holiday cottages in rooms for 2, 4 or 6 people. Most of the cottages have electricity and running water. Sauna is available every evening. We start our tour from Rauhala Village in Kittilä. Rauhala is located ca. 30 km from Levi Ski Resort and ca. 40 km from Ylläs Ski Resort (Äkäslompolo Village). Kittilä (KTT) airport is about 30 min drive from Rauhala and transit is included. Read more how to get to Rauhala. Any medical conditions (such as diabetes, heart disease or epilepsy) or other issue which could influence performance during the trip as well as special diets should be informed to the organiser well before the tour. Take possible personal medication and prescriptions packed in a waterproof package. We recommend that you take an travel insurance with a cancellation cover for your flights and holiday. With an European Health Insurance Card (EHIC) you can receive necessary medical treatment for free or at a reduced cost in Finland, however the card does not render travel insurance obsolete. We start our tour from Rauhala Village in Kittilä, about 30 minutes drive from Kittilä Airport (KTT). We can arrange transfer from any flight arriving to or departing from Kittilä. Rauhala is located ca. 30 km from Levi Ski Resort and ca. 40 km from Ylläs Ski Resort (Äkäslompolo Village). There are several ways to get to Rauhala. Deposit (reservation fee) is 200 € / person . Deposit is primarily paid with credit card on booking. Final payment is due 12 days prior to tour start and it can be paid with credit card or bank transfer (IBAN) . After you have reserved flight or other tickets, please send us arrival/departure times and flight codes, so we can pick you up right time from the airport or inform about arrival to Rauhala. Please inform us also any health/medical conditions or special diets, we should take into consideration. If the passenger cancels the booking for no particular reason (see Package Travel Act, § 15) at least 12 days before the departure date the cancellation cost is equal to booking fee. Later cancelations are assessed the entire program fee . Office fee is 75€/person (in case of changes or cancellations defined in Package Travel Act). The company (Netgalleria Oy - Feel The Nature Treks ) is a package holiday company registered by Finnish Competition and Consumer Authority and it has lodged security against advance payments for travel. This tour is a package defined in Finnish Package Travel Act. For more information: http://www.kkv.fi/en/ . Due to the weather conditions and other circumstances changes to the program are possible. Socks – Medium thickness wool / synthetic socks or medium socks teamed with a liner.